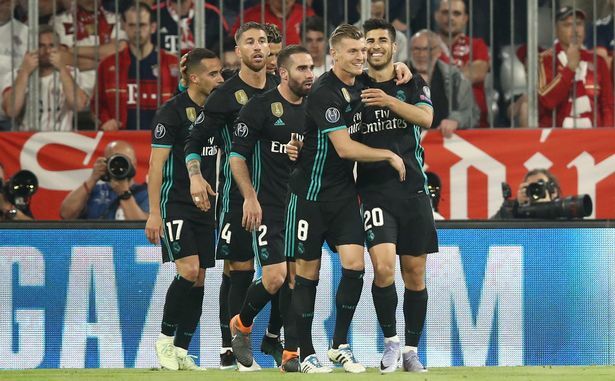 Real Madrid came back from a goal down to defeat Bayern Munich 2-1 at the Allianz Arena on Wednesday night in the first leg, Uefa Champions League semi-final match. Los Blancos went behind in the 28th minute through Joshua Kimmich who smashed the ball past Keylor Navas. Bayern took control of the game from that moment and should have doubled their lead through Frack Ribery who missed a glorious chance. The Bavarians were left to rue all their missed opportunities when Brazilian full-back Marcelo levelled the scores for Madrid in the 44th minute just on the brink of halftime with a sweetly struck shot from the edge of Bayern’s vital area. On resumption of the second period, Marco Asensio who replaced the ineffective Isco in the 46th minute was on hand to score the winner in the 57th minute to hit the final nail on the coffin of Bayern. he just clipped the ball into the bottom corner, after an error by Bayern led to a swift counter-attack resulting in the goal. Conceded two goals which were none of his faults. Scored a marvellous goal to give Bayern the lead. No Bayern player has scored more goals than him in the Champions League this season, except Robert Lewandowski. Substituted early in the match due to an injury. Had a solid game in defence but nearly gifted Madrid a goal late in the first half when his pass was almost intercepted by Luka Modric. He was a suspect all night and was responsible for the error that leads to Madrid’s second and winning goal. Held the midfield well and also provided adequate cover for the back line. Limped off the field after only 10 minutes and was replaced by Thiago Alcantara. The former Madrid man had a great game and provided the assist for Bayern’s only goal. He is always at the right spot at the right time and was unlucky not to have found the back of the net. He was lively, energetic and full of running. even at his age, he missed a gilt-edged chance that would have doubled Bayern’s lead in the first half. He missed a glorious chance to draw level for Bayern late in the second half, this was unlike Lewandowski. He had a pretty quiet evening and didn’t do much to help his team. Slightly at fault for Kimmich’s goal, he later redeemed himself with some fantastic saves that preserved Madrid’s lead. Provided a delightful cross that set-up Marcelo’s goal, he got into a few crunchy tackles and was lucky to still remain on the pitch. Commanded the defence line very well and ensured that Lewandowski was kept quiet all through the encounter. Hardly put a foot wrong, combined seamlessly with his defensive partner to keep Bayern’s attacking forays at bay. Marcelo scored a wonderful goal to draw level for Madrid, he was glorious in supporting the attack but was found wanting in discharging his defensive duties on a number of occasions. He was rugged in the midfield, did nothing flashy or outstanding, he just did the simple things at the right time and was replaced by Mateo Kovacic in the 83rd minute. He was outplayed in midfield by James Rodriguez. he could not string his usual passes well. Kroos didn’t do much to support the attack nor the midfield, it is a huge surprise that he was not substituted. He replaced Gareth Bale on the left and didn’t make such a great impact to deserve a regular starting berth. He was completely ineffective in the match and was rightly replaced by Marco Asensio in the 46th minute. Ronaldo was off-colour in tonight’s game as he failed to get any shots on target, and this is the first time it will happen in any competition since February 2017.